This world has gone absolutely mad! With a rifle in your hands deal with various monsters and collect vials, that soon will be able to transform you into the monster. Use monster's special abilities to ease the level completion. This is nothing, but a genetic madness! 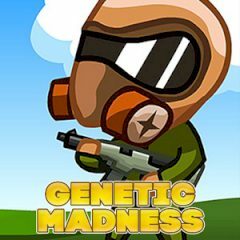 The planet is being invaded by various monsters, but with a rifle in your hands you can stop these evil creatures. Kill them and collect colored vials from their corpses. Mutate into other creature and get its special abilities. Get to the places, that were locked to you a moment ago and find the exit.